An architect by training, Mir-Hossein Mousavi was, from the 1960s, close to the forces that created the 1979 Islamic Revolution. Imprisoned in the period leading to the revolution, he later joined Ayatollah Khomeini's close associate, Mohammad Beheshti, who founded the Islamic Republican Party. Later in that year he was appointed by Khomeini to the Iranian Council of Islamic Revolution and went on to hold important positions under the new regime, including foreign minister and prime minister (1981-89). Mir-Hossein Mousavi was the highest placed of three presidential challengers to current Iranian president Mahmoud Ahmadinejad. 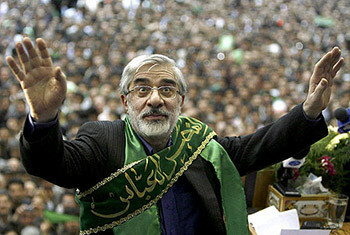 After the election, Mousavi claimed that the ballot had been fixed and that Ahmadinejad should step down as president. However, Mousavi still retains a firm belief in the Islamic regime that governs Iran; he is not a secularist. He praises the revolution, upholds the constitution, and defends the security forces, including the Basij paramilitary. These days and nights form a pivotal moment in our history. People are asking one another: "What should we do? Which way should we go?" It is my duty to share openly with you what I believe, talk about it with you, and then learn from you. May we never forget our historical mission or abandon the burden that rests on our shoulders, which is the destiny of past generations and times. Thirty years ago, in this country a revolution became victorious in the name of Islam, a revolution for freedom. It was a revolution for the revival of the dignity of mankind, a revolution for truth and justice. In those times, especially when our enlightened Imam [Khomeini] was alive, great capital was invested in the form of lives, property, and personal dignity in order to strengthen this blessed edifice, and many great things were achieved. An unprecedented enlightenment took hold of our society, and our people came to a new life, a life that was sweet for them, despite the fiercest of hardships. What this people gained was dignity and freedom and foretastes of the life of the saints [i.e. the twelve Shi'i imams]. I am certain that those who have seen those days will not be satisfied with anything less. Did we as a people cast away some of our abilities so we were no longer able to experience that spirit-warming expanse? I have come to say that it is not so. It is not too late; our road still takes us near that enlightened space. I have come to say we can live spiritually, and at the same time live in the modern world. I have come to repeat Imam's warnings about rigidity. I have come to say that evading the law leads in the end to dictatorship and to remind you that paying attention to people's dignity does not diminish the foundations of the regime, but strengthens them. I have come to say that the public demands honesty and integrity from those who serve them, and that many of the traps we have fallen into have arisen from lies. I have come to say that backwardness and poverty, corruption and injustice are not our destiny. I have come once more to invite you to the Islamic Revolution, as it once was, and the Islamic republic as it should be. [T]he essential message of the revolution, even in my inadequate speeches, was so appealing that it excited the younger generation, a generation that had not lived through those days and which sensed a gap between themselves and that great inheritance, and recreated scenes which we had not seen since the days of the [revolutionary] movement and the holy defense. The spontaneous people's movement chose green as its symbol. I confess that in this, I was their follower. And a generation that had been accused of being far removed from religion, now chants for its slogan, "God is Great," and finds its support in the words, "Victory is from God and conquest is near," "O Imam Hussein" and the name of [Imam] Khomeini to prove that when this goodly tree bears fruit, all its individual fruits will resemble one another. They were taught these slogans by no one, save for their own inner natures. How unjust are those people whose petty advantages have persuaded them that this miracle of the Islamic Revolution was produced and paid for by foreigners, calling it "the Velvet Revolution." If the large amount of cheating and vote rigging, which has set fire to the harvest of the people's trust, is put forward as evidence that there has been no cheating, the republican nature of the state will be dragged to the slaughter house, and the idea that Islam and Republicanism are incompatible will be deliberately proven. As I look out at the scene, I see it ready to achieve goals that are far beyond the imposition of a government that lacks public approval, for I can see that this imposition represents a new type of political life for the country. As a fellow traveler who has seen the beauties of your green wave, I will never allow myself to place anyone's life in danger because of my actions. At the same time, it is my firm conviction … founded on the falsity of the recent elections and on the fulfillment of the people's rights, that I should remain undeterred. Despite my limited abilities, I believe that your motivation and creativity can pursue your legal rights in new civil actions and will be established as an instance of perseverance and confirmed as such. Rest assured that I will always stand with you. What this brother of yours recommends, especially to the dear youth, in terms of finding new solutions is not to allow liars and cheaters to steal from you the flag of defense of the Islamic state, and foreigners and strangers commandeer the invaluable inheritance of the Islamic Revolution, which was amassed by the blood of your honest fathers. Through trust in God, and hope for the future, and resting on your own strength, from henceforth establish your own social movements on a foundation of those freedoms that are clearly set forth in the basic law based on the principle of nonviolence. In doing this, we are not confronting the Basij [an auxiliary paramilitary force]. The Basiji is our brother. In doing this, we are not confronting the armed forces [the Revolutionary Guard]. The Guard are the keepers of our revolution. We are not confronting the army. The army is the keeper of our borders. We are not confronting our holy establishment or its legal structures. These structures are what preserve our independence, our freedom, and our Islamic republic. What we are in opposition to are the deceptions and the lies. We are engaged in their reformation, a reformation that will take place through a return to the pure principles of the Islamic Revolution. See, for example, "Open pledge to prosecute Mousavi and the traitors of Iran," nureinwort.blogspot.com, Aug. 13, 2009. "Bayane-ye shomare panj-e Mir Hosayn Musavi khetab-be mardom: nagozarid durughguyan o motaqallaban parcham-e defa' az nizam-e Islami-ra az shoma be-robayand," Khabar-name-ye Guya, June 20, 2009, news.gooya.com; Naj, "My Translation of Mousavi's Latest Statement," iranfacts.blogspot.com, accessed Jan. 29, 2010. "Mir Hossein Mousavi's Interview with Kalame," Khordaad88, Feb. 2, 2010. Related Topics: Iran | Spring 2010 MEQ receive the latest by email: subscribe to the free mef mailing list This text may be reposted or forwarded so long as it is presented as an integral whole with complete and accurate information provided about its author, date, place of publication, and original URL.